The carbonara recipe is another excellent example of Italian pasta cuisine, simple to make, yet delicious... my favorite pasta dish at the moment! It is said that this recipe takes its name after the fact that they used this inexpensive high-energy pasta meal to feed the coal-miners; in italian 'carbone' means coal, and this is where the name comes from, 'carbonara'. 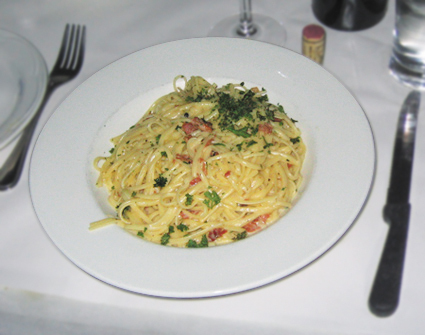 More on this history of carbonara sauce here. This recipe uses eggs, cream, cheese and bacon. The traditional Italian spaghetti carbonara sauce recipe doesn't have cream, but many chefs in the United States and elsewhere use cream in their sauce, so here it is... The traditional recipe, carbonara without cream, follows later on this page. IMPORTANT: all the ingredients have to be at room temperature, before you start! Fill a large pot with cold water and add a tablespoon of salt. Cover the pot and boil the water under high heat. Cook spaghetti (or any chosen pasta) as per package instructions (less boiling time for al dente). If you have pancetta or prosciutto instead, just saute very slightly. Remove bacon (pancetta) from pan lay on paper towels, to drain fat. Combine the cheese, salt, pepper, cream and olive oil in a skillet and beat with a whisk until well blended. toss with the eggs and carbonara sauce, then add the cooked bacon and chopped parsley. Preparing each individual plate, sprinkle fresh ground pepper and grated parmesan, for a nice presentation. Serves 4 spaghetti carbonara portions... enjoy! especially to have the eggs at room temperature before you start. Heat a chunk of butter in a pan and add the pancetta. If this makes too much fat in the pan, drain some off with a spoon. Press in the garlic once the extra fat is removed, cook for one more minute. At this point, beat the eggs in a bowl. The cheese in the eggs helps to keep them from scrambling when they meet the hot pasta. Using a ladle half of the hot pasta water and toss with the pancetta for about a minute, and finish cooking on low heat. (this will help make sure the eggs dont scramble, too). adding more cheese as preferred. Serve immediately, topping each individual spaghetti carbonara plate with grated parmesan cheese, freshly ground pepper, to taste.